I had always assumed that FEMA was the primary source of aid for victims of natural disasters such as hurricanes. If my experience in the aftermath of Hurricane Harvey is any indication, I was wrong. After I returned home in the middle of the storm, we were isolated by flooded roads for a couple of days. Once we could leave our neighborhood, we made our way to our church, which was serving as a shelter for storm victims, to offer our help. 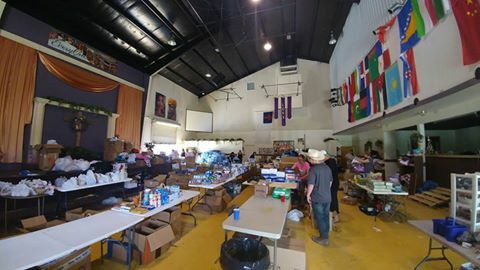 After another day or so, with several storm victims leaving to go home, the evacuees housed by my church were moved to another church down the road that was an official FEMA center for relief supplies. My family and I spent much of the week following Harvey’s departure volunteering at this FEMA center a few miles from my house. What we saw changed the way that I viewed relief efforts for natural disasters. It was not the government that offered the most assistance to those in need. It was private volunteers, both local and from around the country, and private donations of supplies that kept the center in business. The center was staffed entirely by volunteers. There were people who drove or flew in from Oklahoma, Arizona, Kentucky, Iowa, Missouri and California to offer their assistance. These people took time off from work and paid their own way. The only medical professional at the center was a registered nurse from Arizona who paid her own air fare to come and help. In the first days, the center was staffed mostly by local volunteers. After a few days, we started to see more Red Cross volunteers and help from the outside. Red Cross would bring shipments of prepared meals, cleanup kits for houses and comfort kits for those in need. In the days that I worked there, I never saw a single FEMA representative. Most helpful were the churches and their members. Local individuals would bring in food, clothing and other donations. Churches from out of state would rent trucks and trailers and fill them to the ceiling with pallets of water, food, clothes, school supplies, toilet paper, tarps, diapers, pet food and cleaning items such as buckets, bleach and mops. One truck contained several large boxes (about three feet long by two feet wide and two feet high) that were filled to the top with individual candy bars and chewing gum. As a note to potential donors, while this was appreciated, chocolate candy bars are not the most practical emergency ration for Houston in August where temperatures are normally in the high 90s. This advice also applies to Florida. We would frequently see large military helicopters such as CH-47 Chinooks and UH-60 Blackhawks flying overhead. The center director told us that the government was flying supplies into Houston and then they were distributed out from the city. We received some supplies from FEMA, in particular several boxes of tarps, but the vast majority of relief items came from the charity of local individuals and churches from around the country. When the center needed items such as diapers and baby formula, it was concerned citizens who brought them. When we gave out so much food that we almost ran out, it was churches who trucked in enough to allow us to restock. Through the entire ordeal, I was amazed at how responsive people from around the country were to the specific needs of our little FEMA shelter in small town Texas. We put out requests for specific supplies on social media and the next day they arrived. FEMA requires shelters to have round-the-clock security, but this was also left to volunteers. After some items were stolen, we heightened security at the center. Volunteers, most of whom also worked all day at the shelter or full-time jobs, took guard duty shifts at night. After the initial thefts, guards armed themselves with personal weapons and radios. In the wee hours of one night, a guard discovered a break-in. The perpetrator fled into the darkness when the guard chambered a round in his shotgun. As volunteers had to return to their normal lives, the center director requested assistance from the national guard in protecting the center’s residents and supplies. As of this writing, two weeks after Harvey, security is still in the hands of volunteers. Granted, a natural disaster the size of Hurricane Harvey taxed the ability of FEMA to deliver aid. The storm ravaged hundreds of miles of Texas coastline and caused flooding all over Houston, the fourth largest city in the country, before moving on to Beaumont and Louisiana and wreaking havoc there as well. Our area, a small town on the northeast side of Houston, was far from being the area hardest hit by the storm, but there were still many people who had lost everything. If it was up to the federal government or NGOs like the Red Cross to offer aid, our town would probably still be waiting for help. The destruction simply covered too much ground and affected too many people for even the federal government to effectively render aid to everyone. In some cases, people were even afraid to be helped by the government. Wes, a volunteer who came from California by himself to help, told of finding a family of illegal immigrants in an area where the water was estimated to have been 25-30 feet deep. They had gone for days without food or fresh water and were afraid to approach government aid workers for help. Without Wes’s compassion, they might have died after surviving the storm. When massive need for help overwhelmed the system during Harvey, it was the American citizen who stepped up to help. It struck me that this is the way it should be. If Americans, particularly Christians, offered more charity to each other on a regular basis, there would be no need for the entitlement state. We can rise to the occasion during an emergency. It’s a pity that we can’t do so every day.